In her book The Monopolists, Mary Pilon explores the secret origins of the game Monopoly, which begin with Lizzie Magie, a forgotten feminist who patented her Landlord's Game in 1904—not, as many think, a man during the Great Depression. By World War II, Monopoly was a blockbuster, with Magie already largely written out of the narrative. The game's legend only grew, as did stories of what role it played during the war. In this excerpt, we learn how the game intersected with prisoners of war. Bombs were dropping all around the London offices of MI6, the British Secret Intelligence Service. It was March 26, 1941, and earlier that month, Hitler had ordered an expansion of the concentration camps at Auschwitz. Blocking out the explosions, an agent took to his typewriter and wrote to Waddingtons, the British game company that was producing England's version of Monopoly. On the other side of the war, Germans had realized the potency of using games as a teaching tool for the Hitler Youth, including Juden Raus (or "Jews Out") and Bombers over England, a game that rewarded players for dropping bombs on the English countryside. In his letter, the agent recapped the conversation he'd had with Waddingtons' top executive, Victor Watson, earlier that day and stressed the need for secrecy. Waddingtons had just been enlisted in one of the Allies' most peculiar missions. A similar effort involving game companies was under way across the Atlantic. 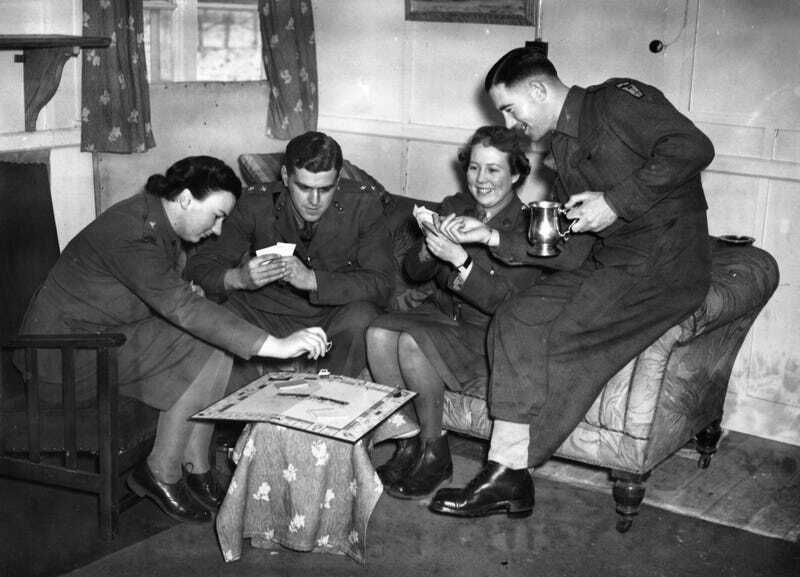 During World War II, the Allies used a variety of objects, including games, to smuggle goods in to prisoners of war. Radios were hidden in cribbage boards, silk maps in decks of playing cards, and compasses in buttons or in the lining of clothing. Table tennis sets proved to be particularly useful, as maps could be easily folded up and tucked into the handles of wooden paddles. Cigarette cases, cigars, books, cotton handkerchiefs that changed color with the aid of certain liquids, a pencil that held a map, a cigarette holder–telescope, games of Snakes and Ladders, and reversible uniforms that allowed soldiers to disguise them- selves as German officers—all these came into play. In America, military officers purchased Monopoly boards and steamed off their top layer to create a center cavity. Inside, they placed maps. The process was tricky—some boards steamed open more easily than others—and bypassed the direct involvement of Parker Brothers. Other game companies participated in the war effort. Milton Bradley turned its game-making factories into ones that manufactured missiles, submachine guns, rifles, and joints used in aircraft landing gear. The company also continued to manufacture some games for soldiers—as their founder had done nearly a century earlier during the Civil War. Now under new management, Milton Bradley would become profitable in 1942 and remain successful for years. The Geneva Conventions allowed POWs to receive some letters and goods, including games, to help them pass the time. But relief groups such as the Red Cross did not want to risk their integrity as aid organizations by participating in smuggling activities, so the Allies set up fictitious relief agencies, such as the British Local Ladies Comfort Society and the Lancashire Penny Fund. The addresses of blitzed buildings were sometimes used as well. Waddingtons knew how to manufacture some of the specialized smuggled goods and how to modify the Monopoly boards in which they could be hidden. Clank, clank, clank went the keys of the agent's typewriter. In a letter addressed to Watson, the agent asked for games to be made up containing maps of Norway, Sweden, Germany, France and Italy. The Germans were aware of what the Allies were up to and issued propaganda accordingly. They said that the English had "opened up a non-military form of gangster war" by violating the rules of the Hague Conventions. In order to safeguard the homeland, Germany would retaliate by opening up "death zones," and it warned that "escaping prisoners of war, entering such death zones, will certainly lose their lives." Heartwarming as the tale of Monopoly saving the lives of soldiers may be, it's also unlikely that the games were used directly in aiding escapes. It would be virtually impossible to know the scope of the Allies' use of Monopoly boards or how many POWs were helped by the hidden maps and goods—if any at all. No sets explicitly used for this purpose have ever been found, a fact that gives some game historians pause. However, the mission was believed to have been entirely classified, and materials related to it were destroyed as World War II ended and the Cold War began, in case it became necessary to use such tactics again. But the spread of this legend, as well as the United States' embrace of Monopoly after the war, spoke to the solidified place the game had in the American psyche. Monopoly was no longer just a popular pastime; it had become representative of what was good about America and a positive symbol of capitalism. One theory has it that the secret service operatives smuggled maps to POWs so that they could escape in the event that the war ended in anarchy. Another holds that just the idea of plotting an escape helped prevent POWs from becoming submerged in the mental darkness that can plague wartime prisoners—giving them relief from the sense of hopelessness and stigma associated with being captured by the enemy. The board games with their smuggled compasses and maps also served as reminders to the prisoners that people on the outside were thinking of them and trying to get them out. Then, there were the actual games. "The importance of providing amusement for the forces in their leisure hours and in long periods of waiting and monotony in out of the way places," Prime Minister Winston Churchill wrote to the president of the Board of Trade, the man in his cabinet tasked with economic affairs, in the summer of 1943, "and for the sailors penned up in their ships for months together, cannot be overstated." "It made an enormous difference to one's esprit to know that there were people in England trying to help one," John Powell Davies, a navy flier, told a reporter, decades later, of the Monopoly mission. Davies was among those who spent time in Germany's Colditz Castle prison, a high-security facility for recaptured escapees and important prisoners. Neither was the irony of the Get out of Jail card lost on the prisoners, among them Lieutenant Colonel James Yule, who worked as an army intelligence officer. Captured in Norway and sent to a prison camp there, he escaped. Captured a second time and sent to Colditz, the handsome mustachioed solder aided in the escape of other prisoners. "Without Monopoly," he later joked, "there wouldn't be an England." Mary Pilon is the author of The Monopolists. She previously worked covering sports at The New York Times and business at the Wall Street Journal. She prefers the thimble as her Monopoly token of choice.